For every piece of content we write, SEO is on our radar. We want our content to rank high so visitors come to our site. But do certain content writing techniques impact SEO? And in this post, we’ll cover ten SEO content writing tips for improving search ranks. We also tossed in a few bonus tips to take your content writing to the next level. Let’s get into it. Looking to sharpen your SEO? 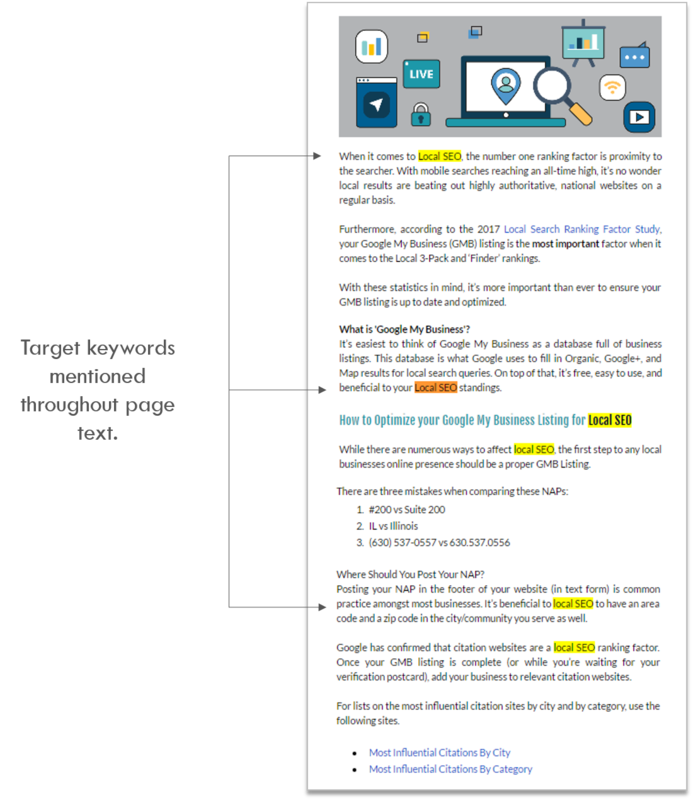 Download the On-Page SEO Checklist to get more traffic from search engines. To kick things off, let’s start with our look in search engines. The goal of SEO content writing is to get search engine traffic. This means searchers need to click. By writing irresistible page titles and descriptions. Here are a few tips to use. Mention your target keyword as soon as possible. For searchers scanning a SERP, this draws attention to your result. Describe what the user will get when they click. Don’t beat around the bush. Keep it straightforward. Use emotion driving words. E.g. easy, awesome, simple, new. It sparks interest in your content. Again, mention your target keyword right off the bat. This reinforces the idea that your content aligns with search interest. Address the target audience directly. You know who you’re writing for. So tailor the result specifically to them. Use emotion keywords when possible. Page description gives you room to work with, so it shouldn’t be hard to throw in emotion drivers. Check out how the Pure Visibility team does it. They pack in the target keyword, ideal reader, and an accurate description. Headings and subheadings go a long way. They break up your content. Because visitors are reading from a screen you have to keep your page light. This means avoiding walls of text. And you can also inject SEO juice into your content by mentioning target keywords. This is good on-page SEO practice. I try to mention the target keyword in my main heading and in a few subheadings when possible. Pro Tip: If your target keyword doesn’t make sense in a heading or subheading, scrap it. Forcing keywords for the sake of SEO will hurt you in the long run. It turns readers off, making them jump ship. You know mentioning keywords throughout your content is a must. Keyword density is a time-tested SEO concept. Because we’re writing content with SEO in mind, mentioning your target keywords throughout your copy is wise. Don’t spam your content to improve SEO. First, it creates a bad user experience. And second, search engines will pick up on your attempt. In the end, both hurt SEO efforts. Instead, mention your keyword when it makes sense. You can see good keyword density in action on the RyTech blog. Their writers mention target keywords naturally every 1 – 2 paragraphs. You can also use latent semantic keywords to build around your topic. These are variations of your target keyword. Looking to add credibility to your content and boost SEO? Then link to other resources. From a credibility perspective, linking to other content (internal or external) gives users the option to explore subjects deeper. Also, if you’re sharing stats in your content, links provide a source. This goes a long way for improving user experience. Next, SEO. Linking your content to relevant pages shows search engines you know what you’re talking about. How? Because you’ve done the homework. You know where to send your visitors for more details. Pro Tip: Use authority websites when linking to other pages. These are sites that have built credibility in their space. The Garfield Group blog shows good examples of how to link. They reference authoritative domains and link to their own relevant content throughout blog posts. This SEO content writing tip isn’t technical. It’s about providing value. Because searchers are asking questions and looking for solutions, you need to provide the answer. And in doing that, make sure you answer search queries quick. Once you’ve done that, then you can elaborate. New visitors coming to your site expect answers immediately. It’s different when you have a subscriber base returning regularly. For this type of content, you can take your time to warm up. But for new visitors, you have to be direct. So make sure you’re answering user search intent at the outset of your content. Here’s a quick SEO content writing win. Not so much to do with content, but more for search result look-n-feel. There are also SEO points to win here. A simple URL gives searchers instant recognition. 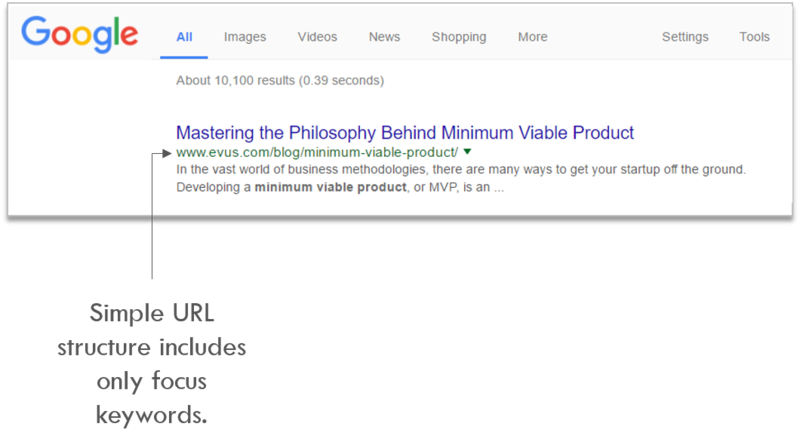 Also, Google prefers simple URLs. As a rule of thumb, try using your target keywords as your URL slug. The content team at Evus shared this tip with us in the past. And you can see they practice what they preach when it comes to optimizing URLs. Writing SEO-friendly URLs is straightforward, so don’t miss out on this quick win. 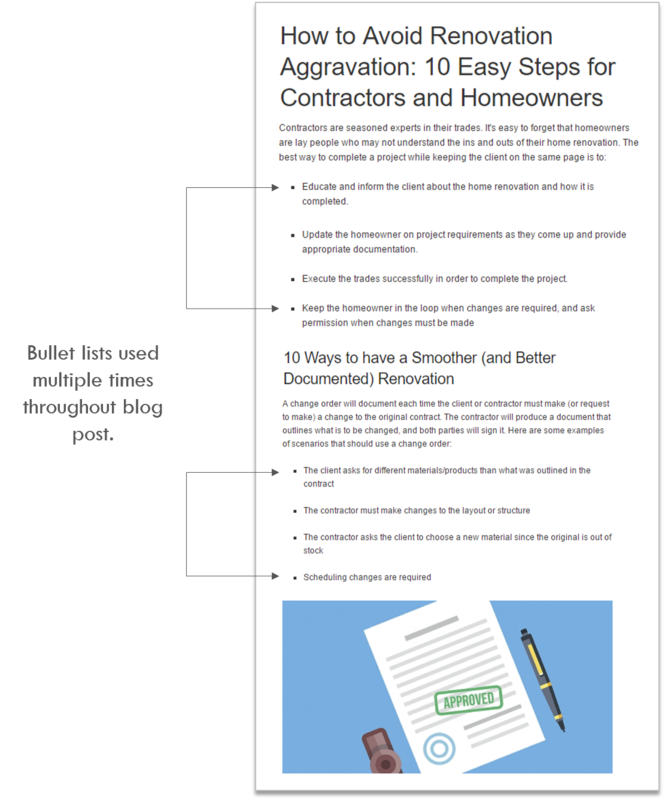 Bullet lists pack a ton of info into a few points. And this is exactly what search engine visitors reading your content are looking for. It also doesn’t hurt to throw your target keyword into the mix. Pro Tip: When you have a long paragraph that’s a goldmine of information – transform it into a bullet list. You might even be able to get away with using your target keyword in unique ways. Here’s an example from the TrustedPros content team. They use bullet lists to explain complex ideas. This takes cognitive load off readers. For any content writing, your goal is to create action. Whether you’re writing content for a blog, landing page, or homepage, you want visitors to take the next step. This is where a strong call-to-action come in. CTAs guide your readers. If your web content does its job, you should see users moving on to other pages. But how is this good from an SEO perspective? 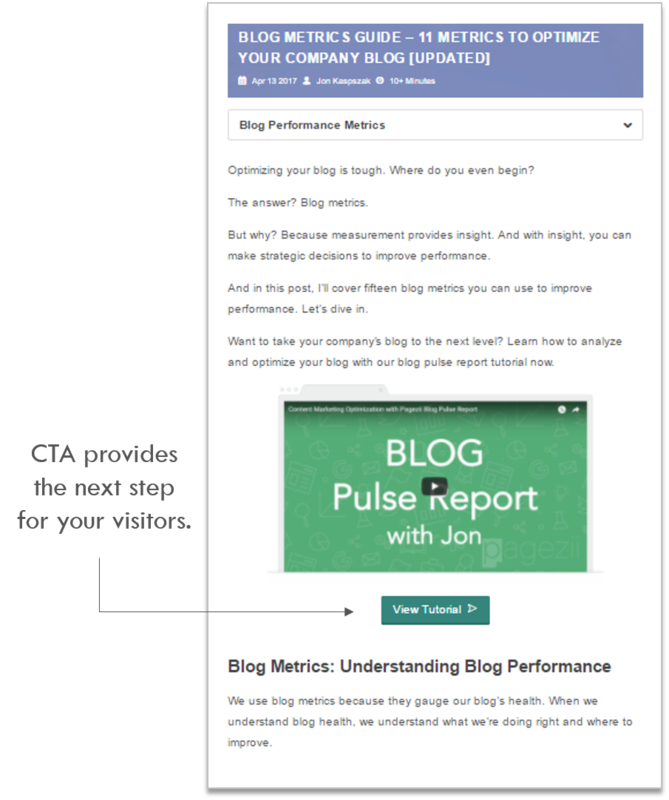 A combination of great content and a CTA improves site dwell time. Pro Tip: Dwell time is the amount of time visitor spend on your site before returning to a search engine. Search engines use dwell time as an indicator for content quality. Back to our call-to-action technique. 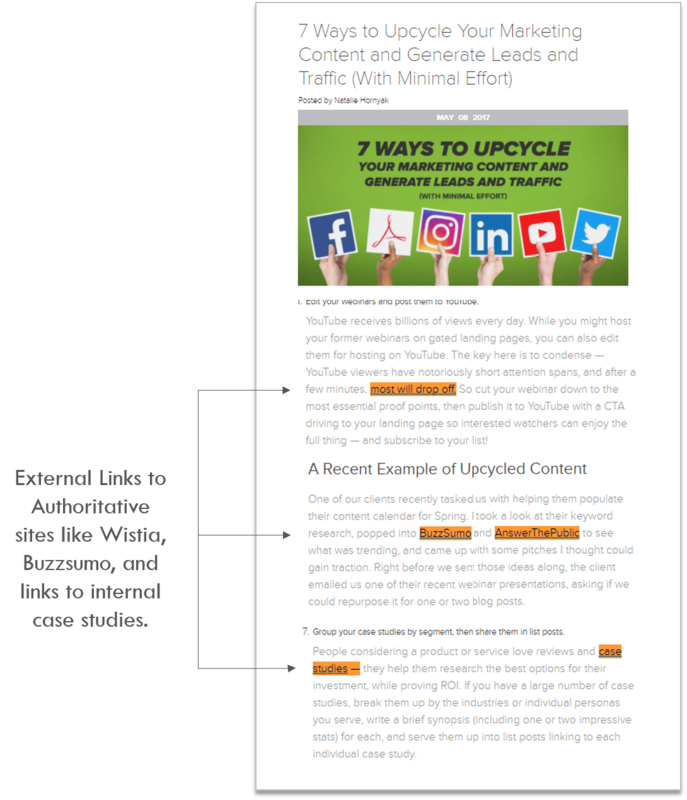 This is one of my favorite SEO content writing tips because it funnels visitors through the lead-gen cycle and it also improves SEO. 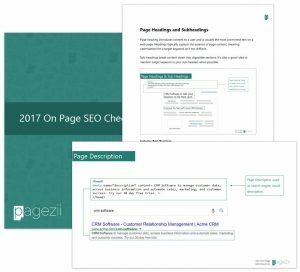 Here’s how we use CTAs on the Pagezii blog. We want to provide a great experience to our readers. And to do that, we use a CTA that leads to relevant content. Shorter sentences keep visitors reading. It makes content more digestible. Similar to the headings and bullet list tips. Make sure you’re practicing shorter sentences on your company blog. When visitors find your blog through search, you want them to stick around and read through the entire piece. This shows Google that searchers prefer your content. Let’s walk through a scenario. A visitor searches for a topic and finds your landing page. What made the visitor click on your result and not your competitors? It’s because you made a promise. You offered a solution to their query. But once the visitor is on your site, they realize you’re not meeting their needs. So what happens? They bounce. From an SEO perspective, this is bad news. Bounce rates are a major factor in dwell time. Your goal is to keep visitors on your site. And this starts with the promise you made in your organic result. So as a rule of thumb, don’t make a promise and not deliver. You might get more clicks, but at the expense of a bad experience. Yes! You’ve reached the SEO content writing bonus tips. These are bonus tips because they’re applicable to specific types of content. Nonetheless, make sure your boosting SEO performance with them. If you’re familiar with the SEO game, you know about long-form content. And you can use your blog to drive site traffic for unique keywords. So when you do hit publish on that blog post, make sure it’s the definitive answer on a subject. So how long should posts be? Try writing content that’s at least +750 words. This gives you enough time to introduce the subject, and dive into the details. Anything less and your content is going to be thin. Meaning search engines won’t give it the quality stamp. I touched on this idea earlier in the post. But it’s worth mentioning as it’s own SEO content writing tip. Emotion-driving keywords are important to use for your organic CTRs. Spicing up your organic headline and description are going to help improve click-through rates. This, in turn, improves SEO performance in the long run. You have to keep SEO in mind when writing content. But there’s a fine line to walk here. You never want to sacrifice quality content for SEO. Search engines have become smart enough to see through that. Instead, you can use these outside the box content writing tips. They work for both copywriting and SEO. What did you think of our SEO content writing tips? Would you include anymore? Let us know in the comments. And make sure you’re maximizing organic visitor traffic to your site with the On-Page SEO Checklist Download for Digital Marketers.